Just finished "Peter and the Wolf" as a 16 page softcover booklet. The story is excitingly retold by Frances Grant. 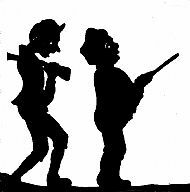 the book is illustrated with18 lively silhouettes. 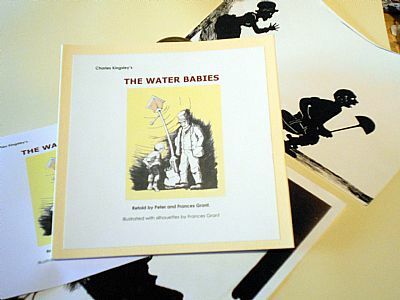 We have also found a similar file of words and pictures for Charles Kingsley's "The Water-babies". We've worked very hard on this material for a month - and have produced a 60 page soft cover booklet of the story (retold). The book has more than thirty silhouette illustrations by Frances Grant. So that's three new books for 2019 already! 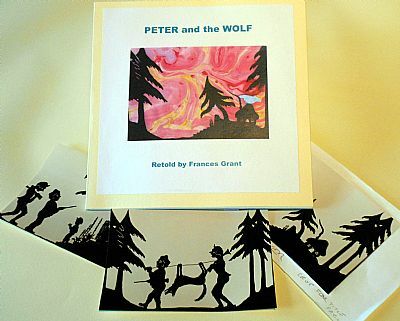 We usually have a "tidy-up" at the beginning of each year, and this year we found a long forgotten box containing photos and drawings of scenes and characters from "Peter and the Wolf" as retold and beautifully illustrated by Frances. We had always intended that this material should one day form the basis of a book. We have just finished the layout and a sample printing in square format. It will have to be Digitally printed - either inkjet or laser. Just finished a poetry pamphlet of "Mist at Sunrise" a short poem by Frances Grant. Four letterpress pages on Clarefontaine 1714, sewn into a grey card cover with thermographic title in silver. 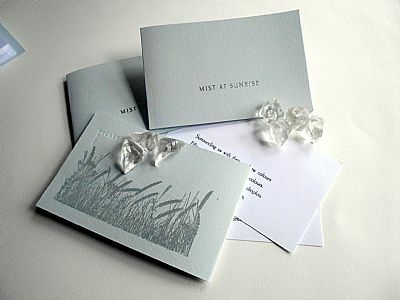 Image of grasses on back cover printed in light grey. It has turned out well using our newly acquired Carlton font. Santa brought a font of 18pt Carlton type. It has been used but only lightly and is in very good condition. Excellent for poetry we think. Carlton was originally designed and cast by Ehmke (Holland) in 1908. The HOLLY AND IVY FESTIVAL OF CRAFTS starts today at the National Trust for Scotland's Threave gardens in Castle Douglas, Near Dumfries. 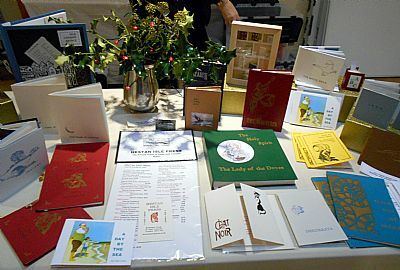 Here is a picture of our stall with our latest books for sale. 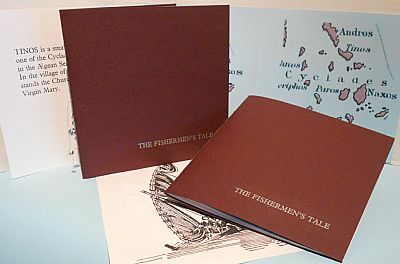 We have just finished "The Fishermen's "Tale". We started printing on some Mixed media paper with a lovely texture - but for some reason this paper has been discontinued - so we had only enough for nine copies. The remaining part of the edition of twenty has been printed on Clairefontaine "1714" 200gsm. The illustrations by Frances Grant have been digitally printed in grey, and the text in 24pt Plantin. It is such a joy to print from brand-new type! card. The booklet is 21cm square. Another Hestan Isle Press book is taking shape. Called "The Fishermen's Tale" it is the story of a miraculous escape from drowning. 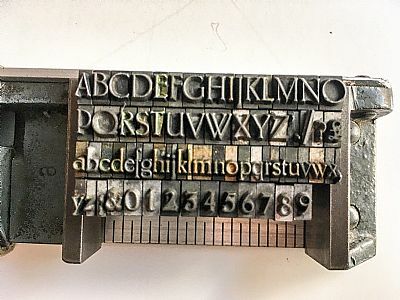 The text is to be letterpress printed from some new unused 24pt Plantin Stephenson Blake type. The Illustrations will be digitally printed from an original pen drawing by Frances. 21cm square it should be quite impressive. The next thing to do is to choose the paper - not an easy task. The weather has been very hot for weeks. Today was a little cooler so we travelled again to Edinburgh, where we delivered a large parcel to the NLS at the Cowgate which contained all of the Hestan Isle Press publications since 1996. So now the Library has a copy of everything! After days of deep snow - we ventured out to Edinburgh today to deliver four copies of "time out of mind" for the Callum MacDonald Memorial Award 2018. Here's Hoping! John Horn at the Poetry Pamphlet Fair at the National Library of Scotland! 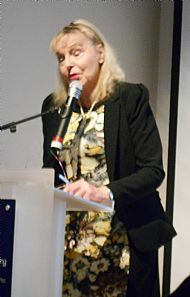 The Annual Fair at the NLS is an opportunity for Poetry Publishers to show and (hopefully) sell their work, but the highlight of the event is that some of the poets whose work is for sale get to read three minutes-worth of their poetry to the public. A lovely man called Gordon Jarvie read a poem of his about the Scottish Midge, but also very generously read Frances' poem "The Fighting of the Midge" - a real bonus! Our friend John Horn from Waterbeck read his poems from "Trio" - a publication of ours which is now in its second edition. A worthwhile evening as always. Makers Fair at Bradford College. We made the 120mile trip to the Old Dye Works Gallery at Bradford College, where we met some very nice people - and hopefully made some new friends. Not many Bradfordians turned up in spite of lots of publicity. The Shipley Wayzgoose was a wonderful day. the sun was shining and it seemed like the whole town had come to the Kirkgate Centre. Whether they'd come to see what a Wayzgoose was, or just to sample the Cafe menu, I don't know. But they came in their hundreds with money to spend. 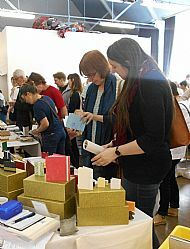 Not only did we sell more of our hand-printed books than at any other fair we've been to, but we met lots of interesting people! 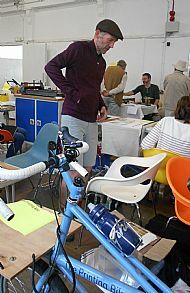 People like the man who had cycled from Land's End to John O'Groats - with an Adana Printing machine on the back of his bicycle - printing whenever he stopped! We had a wonderful day yesterday in St. Andrews at the Stanza Poet's Bookmart. The weather was very wet but it didn't deter the poetry buyers, and our books sold better than expected. We shared a table with Jennie Elliot (The Shed Press) who was winner of the Callum MacDonald Memorial Award 2016. We were runners-up in that competition, and so we swopped books and stories. John Horn has written an amazing critique of our book "Chat Noir"
from which you sadly awaken. of their spell binding narrative. Callum MacDonald Memorial Award at the National Library of Scotland. 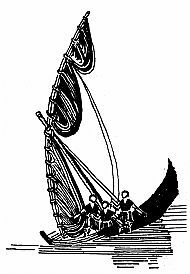 "journey" by John Horn was one of six short-listed Poetry Pamphlets (out of 28 submitted). It was not one of the two winners - but it was a great evening. 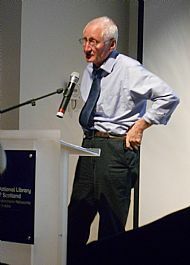 And John Horn gave a wonderful reading of the poem at this his first appearance at the National Library of Scotland. 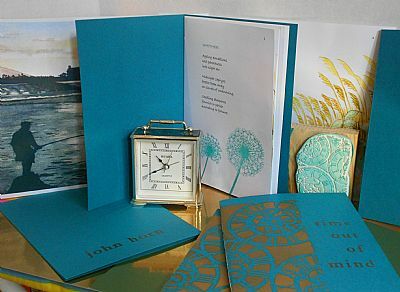 Our latest Poetry Pamphlet "journey" written by John Horn and illustrated by Frances Grant has been shortlisted (six out of the whole of Scotland) for the Callum MacDonald Memorial Award at the National library of Scotland. The awards ceremony is on May 12th at the NLS in Edinburgh at 6pm. Two of our books "Hiawatha" and "London Bridge" have been selected for an artists book exhibition at the Culturale Art Gallery Museum Nabilafluxus, Paese in Italy (near Venice). "King John and the Abbot of Canterbury" is finally finished, and it looks rather good. A year ago we started making our own Photopolymer relief blocks. After a lot of experimentation with different Photopolymer materials we settled on KF95 Solar Plate from Intaglio in London. Exposure time at 10 - 12 minutes seemed to work, with 15 minutes for fine lines. All the illustrations are done - most in two colours - and look good. I have almost finished the 28 verses. Hope to have the book finished soon. 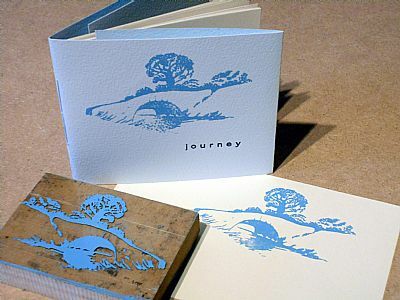 Just finished a letterpress printed poetry pamphlet of John Horn’s lovely poem “journey” with two illustrations by Frances Grant. 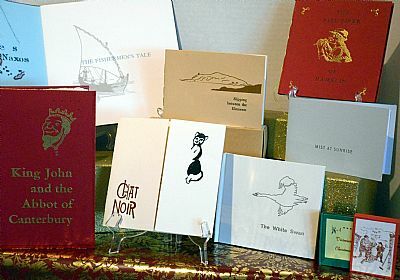 Limited edition of 28 copies on Gerstaecker paper in Bockingford covers, signed by the printer, the illustrator, and the poet. The Annual Poetry Pamphlet Fair at the National Library of Scotland was tonight at 6pm. We met some old friends like Leonard McDermid of the Stitchill Marigold Press (another Letterpress enthusiast), and made some new ones. Bought Stephane Greene’s “Flout” (Happenstance), and Morelle Smith’s “The Ravens and the Lemon tree” (Poetry Scotland). Sold the last copy of John Horn’s “Trio”. A good night was had by all. Our new U.V. Exposure Box has just arrived from p2c engineering on Canvey Island. 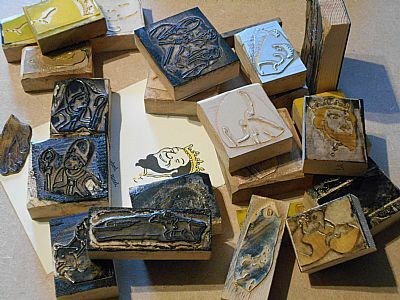 Our plan is to make our own Photopolymer relief blocks from Frances’ line drawings to go with our letterpress type. 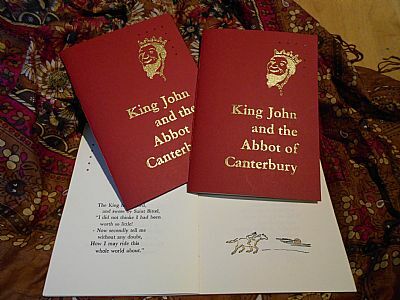 The big project for this year is to print a version of “King John and the Abbot of Canterbury” with two-colour illustrations. Watch this space!